A project to demolish the Soto Street Bridge that links El Sereno, Boyle Heights and Lincoln Heights to improve traffic flow is picking up after years of delay. The local historical society opposes the plan, and says there are other ways to improve the flow of traffic in the area. The project dates back to 2002, but went off track due to a lack of funding. On Monday, 40 to 50 people attended a “community briefing” on the project held at Huntington Drive Elementary School in El Sereno, according to Cora Jackson-Fossett with the Department of Public Works’ Public Affairs Office. Monday’s meeting consisted of a welcome, introductions, a power point presentation and a question and answer session, Jackson-Fossett said. Constructed in 1936, the Soto Street Bridge was a joint venture between the city of Los Angeles and the Pacific Railway System, however the tracks were removed in the early 1960s. 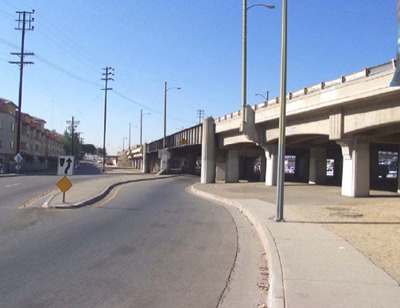 Called the “Soto Street Bridge over Mission Road and Huntington Drive Project,” the plan calls for demolishing the bridge that Caltrans has deemed to be “obsolete” to improve traffic, increase safety and beautify the neighborhood, according to the project’s objectives. The bridge, consisting of one lane in each direction, extends between Supreme Court and Turquoise Street, and links to Mission Road, Soto Street, Huntington Drive North, and Huntington Drive South. The project would improve north and south traffic along Mission Road and Huntington Drive North, according to planners. After demolishing the bridge, intersections with signal lights would be built at Mission Road and Soto Street, and at the existing intersection at Huntington Drive North and Huntington Drive South, according to the project presentation. For local street accessibility, two access roads would be built. Landscaping would also be added to beautify a median area between Mission Road and Huntington Drive North. The environmental studies, a California Environmental Quality Act and a National Environmental Quality Act, were approved last decade (2004 and 2003), but the project was stalled due to lack of funding, Jackson-Fossett said. The El Sereno Historical Society is opposing the project saying it would destroy a historic bridge, that traffic efficiency could be improved by replacing existing stop signs with traffic lights and seismic retrofitting would cost less than demolishing the bridge. The City of Los Angeles, Department of Public Works Bureau of Engineering, Bridge Improvement Division initiated the multi-agency project, according to Councilman Jose Huizar’s office. The $13.1 million project will be funded by the Federal Highway Bridge Program Grant, City Matching Funds Prop G and Prop C, and a Metro grant. According to Jackson-Fossett, the project contract could be awarded in June 2013, with construction possibly beginning in Fall 2013. Construction is scheduled to be completed by Fall 2016. Two to four more community briefings will take place before construction begins, she said. A website containing the project information will be created in upcoming weeks, but in the meantime, those interested in learning more or submitting comments can call Councilman Huizar’s El Sereno Office at (323) 226-1646; Cora Jackson-Fossett in the Public Affairs Office at (213) 978-0333; or George Huang of Bureau of Engineering at (213) 485-2057. Eastern Group Publications. And I actually do have 2 questions for you if it’s allright.